Big screen adaptation of the '80s arcade game. Rampage is the first screen adaptation of a video game that this writer can claim to have played. Back in the day I pumped a lot of coins into its arcade version while on day trips to the seaside, before later purchasing the home version for my Commodore 64 (remember those?). It was a deliciously simple game in which the player got to play as one of three giant monsters - George, a King Kong type giant ape; Ralph, a ginormous werewolf; and Lizzie, a Godzilla stand-in - and destroy representations of American cities (for some reason Peoria, Indiana stands out in my memory). I think the appeal of Rampage for kids was its theme of destruction; kids love to break stuff, so knocking down skyscrapers appealed to our lizard brain instincts. Rampage was a game heavily inspired by movies, so it made sense that one day it might be adapted for the screen. Trouble is, the game had no real plot. Unlike the cinematic video games of today, with their high production value cut scenes and focus on storytelling, '80s games just threw you straight into the action and hoped you didn't ask questions (we didn't). 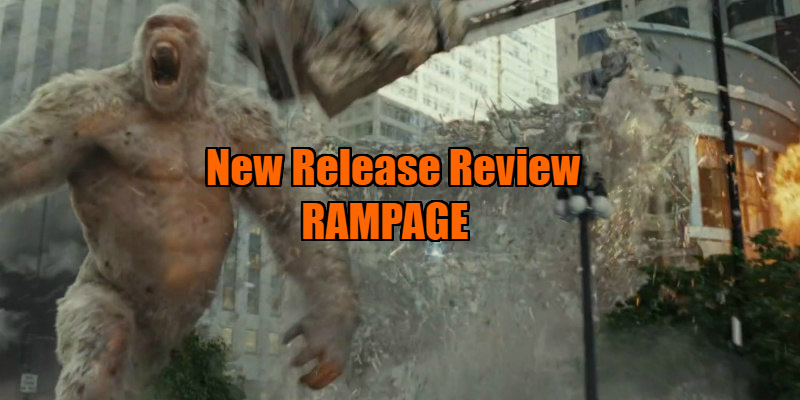 Tasked with coming up with a plot to weave around Rampage's mass destruction are no less than four screenwriters, which is never a good sign. The result is a movie that expends far too much energy on its plot rather than exploiting its premise. Said plot concerns a shady scientific group that has been dabbling in what the film calls 'genetic editing', which is fancy talk for mixing the DNA of various creatures to create mutant hybrids. Apparently the initial purpose was to cure cancer, but brother and sister baddies Brett and Claire Wyden (Jake Lacy and Malin Akerman channelling the sort of villains you might expect from an '80s era Superman movie) have more sinister motivations, which I can't exactly recall because this is the sort of movie that causes your brain to shut down during its opening act. Anyway, after a giant rat runs amok on a spacecraft (stay with me), three samples of some sort of Macguffin juice fall from space and crash land in America, infecting three animals - George, a lovable white ape in a San Diego sanctuary; a wolf in Wyoming; and an alligator in the Everglades. The three creatures mutate, growing to huge size and developing equally large appetites. To attract the giant monsters, the Wydens hook up a radio tower, using its signal to draw them towards downtown Chicago. What could go wrong? 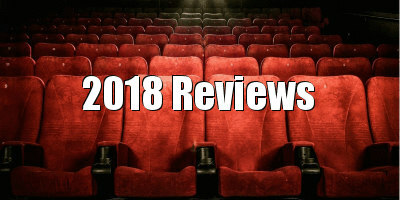 Our heroes are Davis Okoye (Dwayne Johnson), an ex special forces primatologist (seriously, stay with me) and George's best mate; Kate Caldwell (Naomie Harris), a scientist who once worked for the Wydens; and Jeffrey Dean Morgan, chewing more scenery than any of his monster co-stars as Harvey Russell, an agent of some ambiguous government branch. Morgan gets the movie's best line, and maybe 2018's best line, when he introduces himself with this all-timer: "When science shits the bed, I'm the guy they call to change the sheets!" Whichever of the four writers is responsible for that gem deserves to take home an Oscar next February. Sadly, it's a standout line in an otherwise flat script that spends too much time tasking its characters with explaining the nuances of a very silly plot to an audience that is only here for the monster action. The monster b-movies of the '50s always had that one scene in which a scientist explained the plot to the square jawed hero and cantilever brassiere wearing heroine, but it seems like today's mega budget equivalents give us one of those scene every 10 minutes. When said monster action arrives, it's initially quite impressive, with the giant trio wreaking havoc on Chicago, but then it descends into one of those generic modern blockbuster climaxes in which all the action takes place in a giant cloud of smoke, presumably to save the FX crew the hassle of rendering a city. 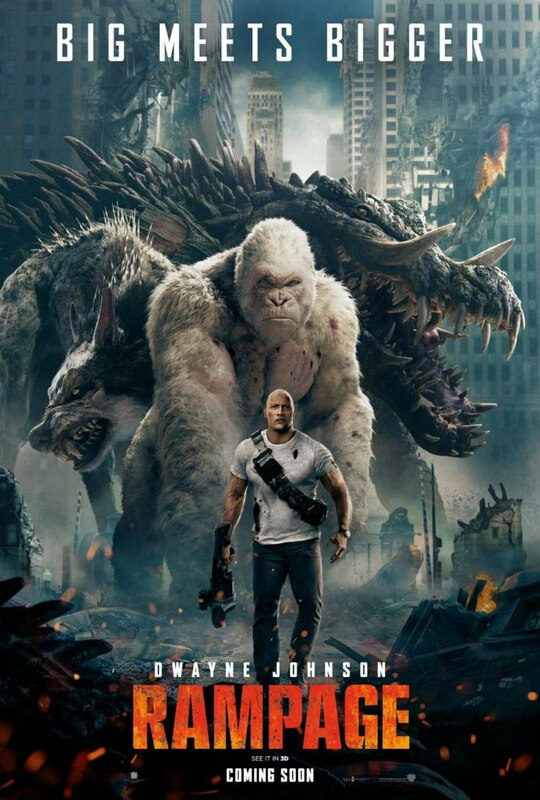 Aside from a few knowing one-liners, Rampage never fully embraces the ridiculousness of its plot, and whenever the monsters are off screen, which is far too much of its running time, it feels interchangeable with a half dozen other movies headlined by Johnson. With his suspect politics but undeniable presence, Johnson has established himself as the John Wayne of our times, and regardless of the quality of the material he's given to work with, he always delivers a fully committed performance with an infectious charisma that papers over a lot of cracks. Rampage however is the first time I felt his boy scout shtick begin to wear a little thin. Later this summer we'll see him leap from a helicopter into a giant tower in disaster movie Skyscraper, and I suspect that may well be the moment that sees him jumping the proverbial shark. Rampage is in UK/ROI cinemas now.